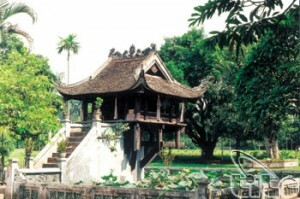 After half a century of being classified as a national historic site in 1962 and seven years of being recorded in the Vietnamese Guinness Book as the pagoda with the most unique architecture in the country, Mot Cot (One-Pillar) Pagoda was recently recognized as “The Pagoda with the Most Unique Architecture in Asia” by the Asia Record Organization. This once again affirmed the nearly-thousand year old pagoda’s historical and architectural values. According to “Dai Viet su ky toan thu” (the Complete Annals of the Great Viet), the pagoda was built in the year of Ky Suu, dated Sung Hung Dai Bao 1 (1049) in the Ly Thai Tong Dynasty. King Ly Thai Tong (ruling from1028 to 1054) dreamt that he met the bodhisattva Avalokiteshvara, who handed him a baby son while sitting on a lotus flower. When he woke up, he told the mandarins about his dream and the monk, Thien Tue, advised him to build a pagoda in the middle of a lotus pond, similar to what he saw in his dream. The pagoda was completed and named Dien Huu that means long-lasting happiness and good luck. Despite being restored several times under the dynasties of Tran, Post-Le and Nguyen, the pagoda retains its original architecture. It looks like a lotus flower emerging from the water’s surface that shows the aesthetic taste and Buddhist enlightening philosophy. “The Mot Cot Pagoda is the symbol of Buddhism and has a great significance. Although it is small, its architecture is most unique and contemporary architectural works can not be compared with it,” said Monk Thich Duc Nghiep, Vice General Secretary of the Vietnam Buddhist Shangha. The pagoda was built of wood on a single stone pillar and resembles a lotus blossom that makes it most unique. The stone pillar is 1.2 m in diameter and 4m high, excluding the underwater part. It consists of two blocks that are connected together and look like one. The pagoda’s roof is decorated with dragons flanking the moon. In the pagoda, the bodhisattva Avalokiteshvara is placed on a wooden and red-lacquered Buddha’s throne at the highest position. With great values in terms of history, culture and architecture, Mot Cot Pagoda has become one of the most famous pagodas in Vietnam.